Type species: Betula alba L.
Vassiljev, V.N., 1970. New species of Birch (Betula L.) from Central Asia and Kazakhstan. Novosti Sistematiki Vysshikh Rastenii 1970:(7) pp.97-127. Reference page. Govaerts, R. et al. 2017. Betula in World Checklist of Selected Plant Families. The Board of Trustees of the Royal Botanic Gardens, Kew. Published on the internet. Accessed: 2017 February 14.
International Plant Names Index. 2017. Betula. Published online. Accessed February 14 2017. The Plant List 2013. Betula in The Plant List Version 1.1. Published on the internet. Accessed: 2019 February 14. Tropicos.org 2019. Betula. Missouri Botanical Garden. Published on the internet. Accessed: 2019 February 14. USDA, ARS, Germplasm Resources Information Network. Betula in the Germplasm Resources Information Network (GRIN), U.S. Department of Agriculture Agricultural Research Service. 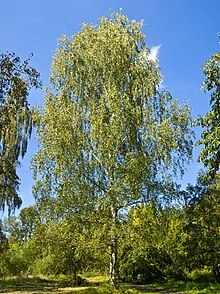 For more multimedia, look at Betula on Wikimedia Commons. This page was last edited on 4 March 2019, at 12:21.